Serena got pulled up by cricketer AB de Villers for taking away Naomi's moment of glory. South African tennis star Kevin Anderson also pitched in slamming the hype being created around Serena's controversy. Serena got pulled up by cricketer AB de Villers for taking away Naomi's moment of glory. Amid the growing controversy regarding Serena Williams outburst at umpire Carlos Ramos, calling him a “thief” and accusing him of “sexism”, the former world no. 1 has come under fire for stealing the thunder of Naomi Osaka, who outclassed Serena in straight sets 6-2,6-4 to lift the title. 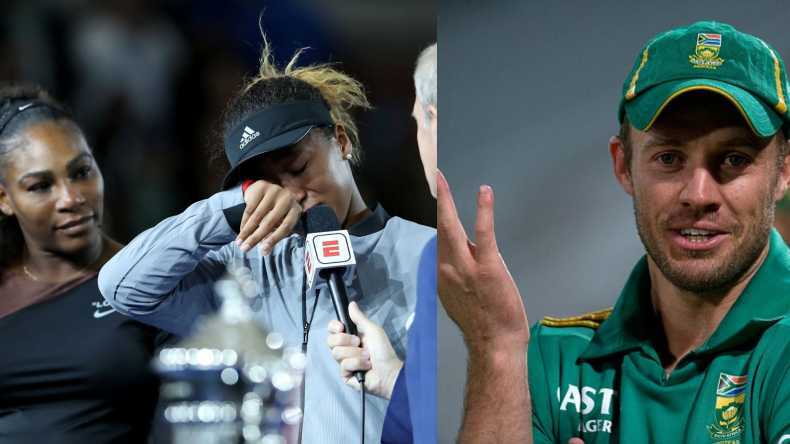 De Villiers was not the only one, South African tennis star Kevin Anderson also pitched in slamming the hype being created around Serena’s controversy. He said Naomi was the “real deal”. Very happy for you on your @usopen title @Naomi_Osaka_. I hope you feel proud for competing against someone you (and the rest of us) admire so much to win your first slam. You’re the real deal! 👊, Kevin tweeted. Tennis star Serena Williams lashed out at chair umpire Carlos Ramos going as far as calling him a “thief” after she received multiple code violations en route to the loss to Naomi Osaka. Later, former world number one Serena Williams defended her comments and said she did not cheat in the women’s singles final against Naomi Osaka on Saturday. The thing took an ugly turn during the second set, when a second code violation for racquet abuse was handed out to Serena, along with a point penalty, this as per Serena is not the case when any men players rant out or break the racquet in frustration. The American Tennis ace exploded after the 3rd violation was slapped upon her and accused the umpire of being a thief and angrily demanded an apology from the official.